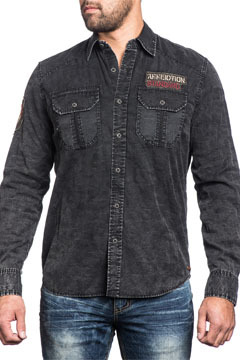 Affliction No Rival mens long sleeve button up woven shirt features a casual look with two pockets accented with Affliction embroidered patch sewn above one pocket on the chest. The back features a small Affliction letter A logo embroidered patch sewn near one shoulder. Black camouflage pattern. Heavy lava wash for distressed and vintage look. 100% Cotton. Slim Fit, Custom Buttons, Contrast Piping at Yoke Seams. Machine Wash Cold. Color: black camo.